Used to produce a wide range of consumer and construction products, polycarbonate physically resembles acrylic plastic sheets, yet exhibits greater strength. Common construction industry applications of polycarbonate include skylight domes and roof covering panels. Alternatively, plastics suppliers offer plain sheets of polycarbonate for fabrication and hobby projects. 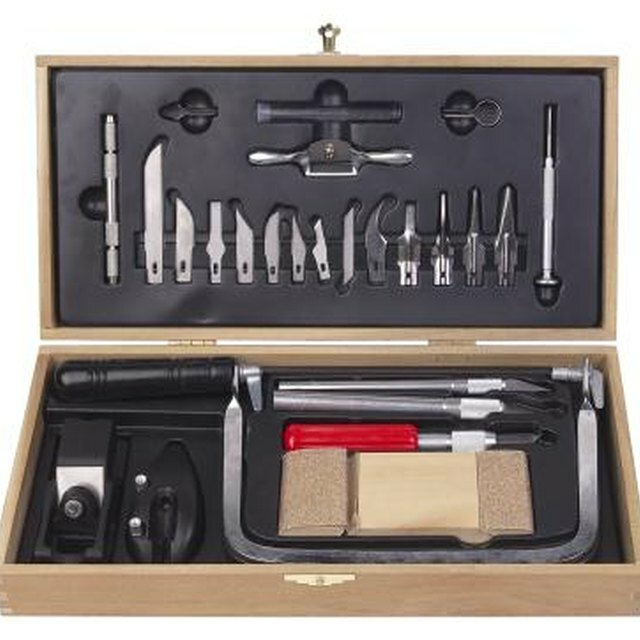 Depending on the type of polycarbonate product that you plan to cut, you can choose from manual hand tools, portable power tools or stationary shop tools. Builders can cut thin polycarbonate, such as roofing and shade cover materials, with manual cutting tools. Common thin polycarbonate products include patio roof panels and plastic water bottles. Manual hand tools, particularly utility knives and construction snips, are sufficient to cut through most thin polycarbonate products. Builders use heavy-duty, fixed blade utility knives to directly cut through thin polycarbonate or to cut polycarbonate via a score and snap process. Widely used to cut sheet metal, construction snips easily shear through thin polycarbonate materials. Portable circular saws cut through both thin polycarbonate, such as roofing panels, and thick, sheet-form polycarbonate. Typically powered by an electric motor, standard circular saws are available in both corded and battery-operated models. A portable circular saw's circular blades create only straight cuts. However, because of their portability, circular saws can easily cut across a polycarbonate sheet's length or width at at angle. Notably, carbide-toothed circular saw blades produce a clean, chip-free edge on polycarbonate materials. Stationary and often bolted to floors or walls, table and panel saws create precisely straight cuts through all types of sheet goods, including polycarbonate panels. While a table saw's blade protrudes from a fixed position at the center of a horizontal table, a panel saw's blade slides vertically and horizontally across an upright support surface. While table saws generally create only rip cuts, or cuts across the length of a sheet, panel saws create both rip cuts and cross cuts. Like a stationary jig or saber saw, the band saw has a thin, slightly flexible blade. The band saw's narrow blade runs from the surface of a horizontal table to an arm suspended above the table's surface. Although band saws create all types of straight and angled cuts through polycarbonate materials, they are especially useful for creating curved cuts, circles and decorative scrollwork. Like power drills, table routers and portable routers cut through materials with a sharpened, spinning attachment called a bit. However, whereas drill bits primarily cut by penetration, router bits are sharp-sided and cut channels as they move side-to-side through work materials. Applied to polycarbonate sheets, routers can create channels for decorative and joinery purposes or they can smooth and shape sharp edges. What Is a Kerf Saw Blade? What Are the Sizes of Folding Tables? What Is a Router Tool? What 4X8 Plywood Lumber Do They Put on Roofs? What are Some Lightweight Decking Alternatives to Plywood?